Rear Disc Rotor I want to share the experience of the purchased goods on the Webike website! I purchased a Sunstar rear brake disc for my Suzuki Bandit 600S motorcycle. Since the rear OEM brake disc worked a very long time, it was the turn to replace it with a Sunstar disc. The disc is of excellent quality. He has good braking performance. The quality of the disc is at the height that I expected from the Japanese quality. Recommend. 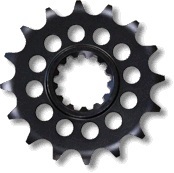 Sunstar Front Sprocket Received ordered item Sunstar 15T front sprocket for my CRF250M in good condition. Product looks in very good quality. Hoping for improved fuel economy Since I often run a highway for a long time, I exchanged NORMAL's 17T to 18T in an effort to lower the engine speed even a little. Acceleration at 6th gear is slightly lacking in Punch, but as I thought, it seems that the feeling of losing feeling decreased and it was easier to ride. The biggest change is that Meter's distance meter is shorter by 7%. In someone's blog, I saw articles measuring 17T and 18T speed with Speed ? ?gun, but there was a case that the 18T speed was very close to the actual speed. Every year when I go to Kyushu, I run all at once to Dannoura, I was up to 1,000 kilometers after Meta's photo up to Net, but if I changed to 18 T, only 930 km would be displayed, this is the exact distance It was a bitter smile with me. The average fuel consumption of the key (Meter display) It was around 17 km to 18 km when it was 17 T, because the value of the distance meter became Small by about 7%, it was about 16 km. I was hoping for a slightly better value for the engine speed drop, but since I often run with skipping, I suppose that I started to run Throttle with a slow feeling as acceleration slowed down. However, 60 km flat road with few signals / If we continue running around h, we will display 22 to 24 kilometers, so it is good. COSPA good looks good Since I was concerned about vibration from Chain at the time of traveling, I decided to exchange, but there was also a used car and Sprocket was thinking about all the exchange. This Quantity : It's far more affordable than purchasing Single Item. Moreover, since I can choose the type of Chain, I am grateful that I can make a selection according to my preference. Perhaps it's quite natural because the feeling of use is brand new, but anyway it's quiet & Smooth. I feel like driving this Motorcycle, Motor, it just makes me feel comfortable running. I chose a combination of Black & Gold, but this look is also imagined and feels good. I do not know because I just exchanged durability, but I'm expecting Large if this Brand is durable. Piece number is different. Piece number was different while writing as car type exclusively. Two Piece so much work to cut. I do not care whether anyone really is disgusted every time. The performance of Chain is perfect, but I do not know because it sells a lot ? ? ? I do not care. Ideal for CBR 250 RR! I installed it in CBR 250 RR MC 51. 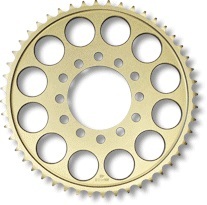 There seems to be a User who exchanges Rear only Sprocket in an invisible place in Chain Cover, but OEMDriveSprocket of MC 51 is equipped with rigid Rubber for noise reduction. Since this is the resistance of Friction it is strongly recommended to replace DriveSprocket together! Only SUNSTAR does not run out! I chose SUNSTAR after Chain replacement work of CBR 250 RR. The difference between the other companies' products is precision! Because other companies have slightly out-of-round circles, only loads not required for the car body are applied. I think that you should choose SUNSTAR if you want to replace it.